Looking for a fun recipe to bake with the kids? These lemon and ginger window cookies are so much fun to make. Use them as ornaments in your window or on your Christmas tree. 1. In a medium, bowl whisk together, then sift, the flour, ginger, baking powder and salt. Set aside. 2. In the bowl of a stand mixer fitted with the paddle attachment, cream the butter and Redpath® Golden Yellow Sugar for 1 minute. Add the egg, vanilla and lemon zest and mix until just combined. Using a wooden spoon, stir in dry ingredients until smooth and no streaks of flour remain. 3. Knead dough a few times in the bowl and shape into a flattened round. Cover with plastic wrap and chill for at least one hour. 4. While dough is chilling, place one colour of candy inside a heavy duty plastic freezer bag. Using a rolling pin or meat tenderizer, crush the candies until they are in ¼ inch (6 mm) pieces. Place in a small bowl and repeat with the other colours. 5. Preheat oven to 350℉ (175℃) and line 2 large baking sheets with parchment paper or a silicone liner. 6. On a lightly floured surface roll out chilled dough to ⅛ inch (3 mm) thick. Cut out shapes with cookie cutters and place on prepared baking sheets. Using smaller cutters cut shapes from within the cookies and remove. If you would like to hang the cookies cut a small hole for a ribbon to fit through. Re-roll scraps and repeat cutting until all dough is used. Freeze cookies for 15 minutes. 7. Bake cookies for 8 minutes, then remove and spoon the crushed candy into to cut out areas, trying not to get any candy on the cookie surface. Add any silver metallic dragées to the candy or press them into the dough, if desired. Return cookies to the oven and bake for another 8 minutes, or until cookies are a light golden brown and all the candy is melted. Cool completely on trays. Once cooled, gently remove cookie (if they stick peel the paper off the back while holding the cookie). Enjoy immediately or hang as an ornament. Different candies may have different melting times. Try to use one type of candy, or if using different types place a teaspoon of crushed candy on a lined cookie sheet and time how long each takes to melt. 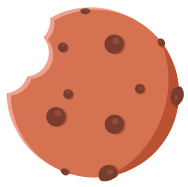 If there is more than a minute difference between candy types, use one type of candy to fill the cookies on one baking sheet, and the other type to fill the cookies on a different baking sheet.